I’ve cooked and burned rice on the stovetop exactly twice. After the second time, I bought a rice cooker and enjoy that babysitting or destroying rice is no longer a part of the process. $50 well spent! Rice cookers are especially great for making sushi rice because they cook the rice super-evenly for rice-challenged folks like me, help the lazy be who they are (dump rice in cooker, add water to cook, push button, wait, rest and fluff) or keep the sushi-making process low-key and minimally fussy as possible. To make the mushrooms, place several inches of oil into a small, heavy dutch oven or cast iron pot (I use Lodge’s cast iron) over medium-high heat. It will take anywhere from 5-7 minutes for the oil to be ready. While you are waiting, throw a fourth of the chopped mushrooms into the Ener-G mixture and toss to coat. Shake off any excess moisture, then place into the cornstarch, gently tossing with your hands. Test the oil for readiness by throwing in a pinch of cornstarch. If it sizzles immediately, you are ready to fry. Shake off any excess cornstarch from the mushrooms and gently lower them into the oil using a skimmer and fry until golden brown, no more than 3 minutes. Transfer the fried mushrooms to a paper towel to drain while you repeat the process in batches with the rest of the mushrooms. To assemble the rolls, divide the cooled rice into 4 portions. Slide a sushi mat into a large Ziploc bag or cover with plastic wrap. Place one sheet of nori, shiny side down, on the mat. Moisten your fingers with some water to prevent rice from sticking to them, then spread the rice evenly over the nori sheet, leaving about an inch exposed at the top. Sprinkle with one tablespoon of the sesame seeds, if desired. Divide the fried mushrooms into 4 portions. Drizzle one portion with the dynamite sauce until evenly coated. With the exposed end away from you, form a thin line of some of the mushrooms along the side closest to you, adding a couple slices of avocado. 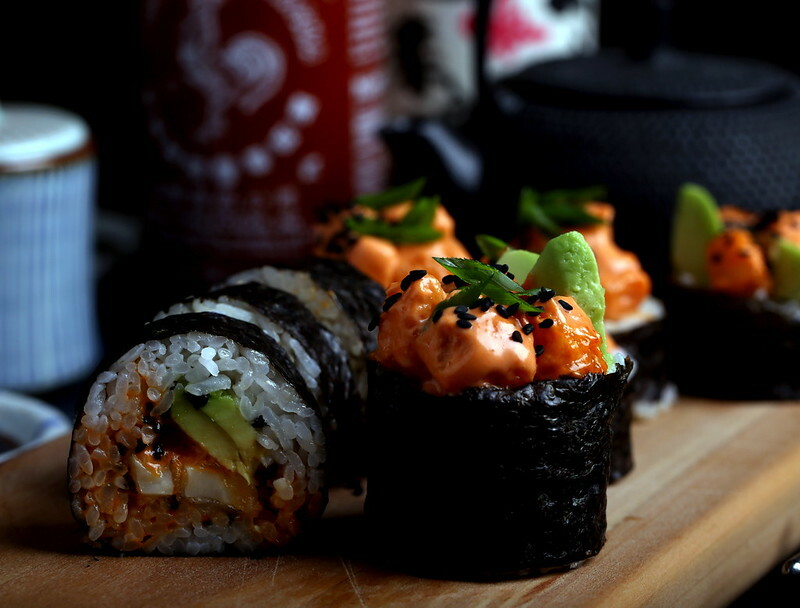 Roll the sushi away from you, gripping the mat tightly but gently. Once rolled, seal the end with water or add a few grains of rice to the end to help seal. Now cut the sushi in half with a very sharp knife (I run the blade under scalding water for a cleaner cut), then each half into halves, then those halves into halves to make 8 pieces. Place onto a serving plate, spooning the leftover mushrooms over the top. Repeat this process to make 4 rolls. Finish with chopped scallions and extra sriracha, if desired. I love sushi. I have not had a lot of WOW sushi since I've been vegan. I have go to try these! Hello! I found your blog (highlighting this recipe) on Finding Vegan. 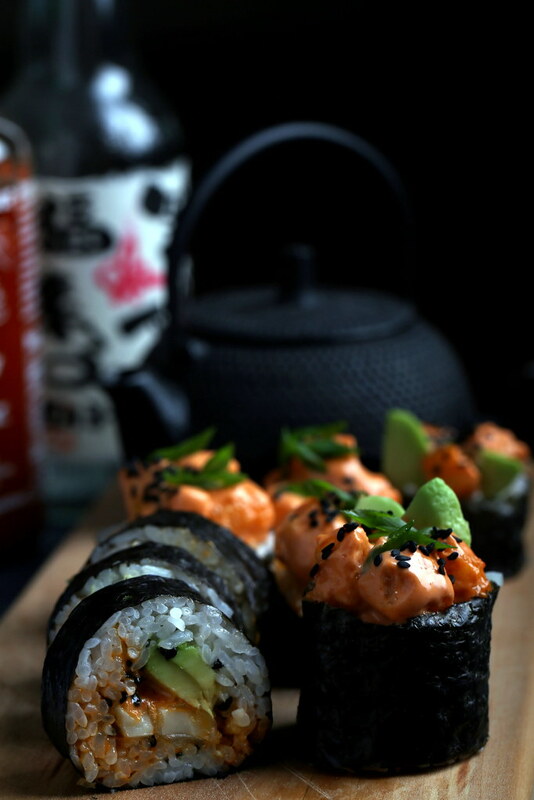 The sushi looks delish, and I LOVE your blog w/o ads! I could scroll through and look and read w/o the page taking 5 minutes to load and then just to stall/freeze. This is the kind of blog I like to read, thank you! I made this last night. It's the best sushi I've ever made! This looks incredible!!! I’m about to take a vegan sushi class!! Hopefully, I’ll figure out how to make sushi look like sushi, & not a hot mess. ? A question about your recipe: Is there something I may use as a substitute for cornstarch(which is made out of GMO corn). ? If you don’t want to use cornstarch, I would just suggest googling alternatives for it. Maybe rice flour can be used in its place? Good luck! Kuzu root starch and arrow root starch are alternatives to corn starch. I don’t know if you would need to change the amount, though. Thank you so much! ? I’m new to your gorgeous website, and either I found you on Instagram, or someone referred you via IG. The raw, vegan sushi class will be in about a week, & just as soon as it’s completed, I’ll be making your luscious looking sushi stat!! ?????? This is so inspiring, I’m a 22 year vegetarian and have nothing like this in my repertoire. Can’t wait to put an evening aside and try two or three different rolls! I made these last night, and I was seriously impressed. I’ve been making vegan sushi for a while, but I’ve always used tofu, carrots, avocado, and sometimes bell peppers as fillings. They’re okay, but not amazing. These were incredible! Regina, I love to hear that, so happy you liked! Mushrooms are so amazing in sushi! I desperately wanna eat this tonight, it looks so delicious. no worries, found the answer on the enoki recipe! wish me luck tonight! Mary’s test kitchen brought me here for your lox recipe which i will be making for Valentine’s day 😊 Im considering doing this recipe also but what is Ener-G? Which product by Ener-G are you using for this recipe. It looks amazing. I can’t wait to try it. Cindy, I used their egg replacer here. I hope you enjoy!